This was one of my projects in 2010, and I updated these pages as I progressed. 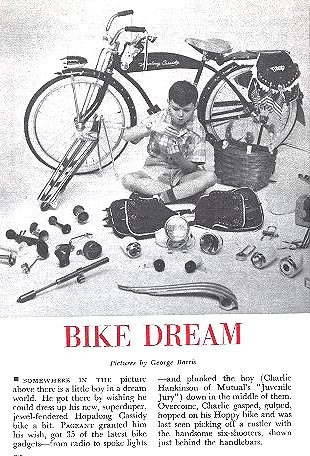 If you’re reading this, you probably have bike dreams too. 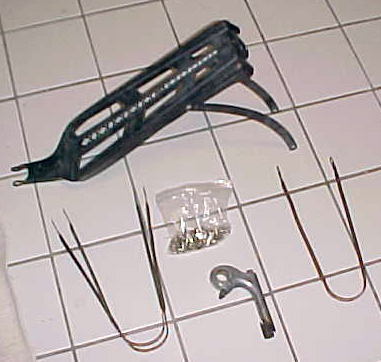 British enthusiasts may have somewhat more mundane bike dreams, such as searching for elusive brake linkage parts for their 100 year old Sunbeam. We didn’t have ‘Hoppies.’ But practical dreams are healthy for our aging minds. 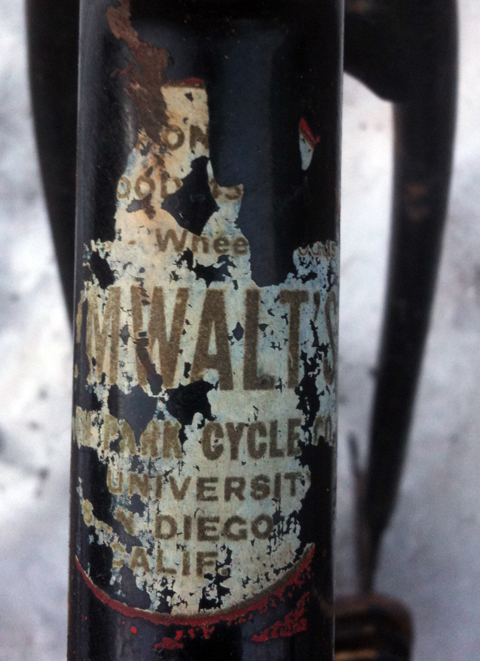 That’s why our hobby, bringing derelict vintage bicycles back to life, is becoming so popular. 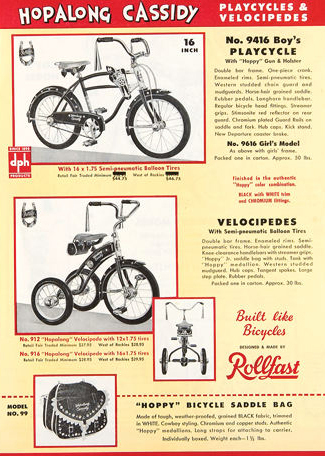 A modicum of mechanical skills, a minor financial outlay, and the ability to research our particular machine – which, in this internet age, can be done from the luxury of our own home – provides endless hours of enjoyment as we accumulate the parts we need to transform a bike dream into a dream bike. As you can see, I’ve got quite a way to go. 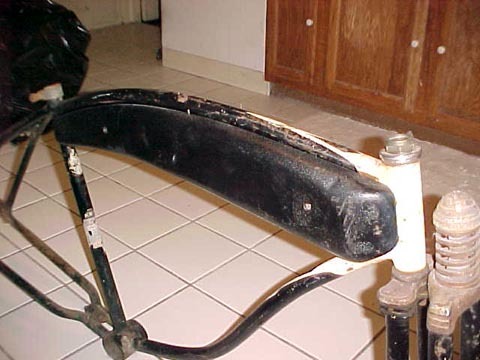 But I’ve already located a hoppy style rear rack and a full set of proper rivets for the fenders. The next thing I need is fenders to put them on. 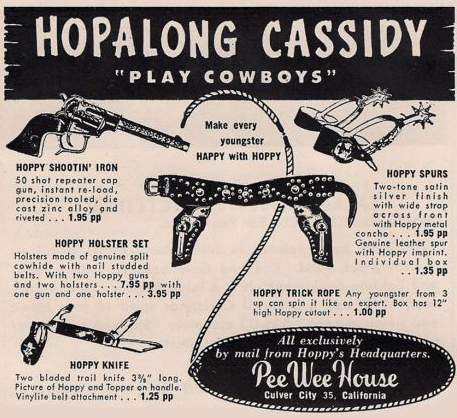 Hopalong Cassidy was introduced in 1907 as a fictional character in a story by Clarence E. Mulford. 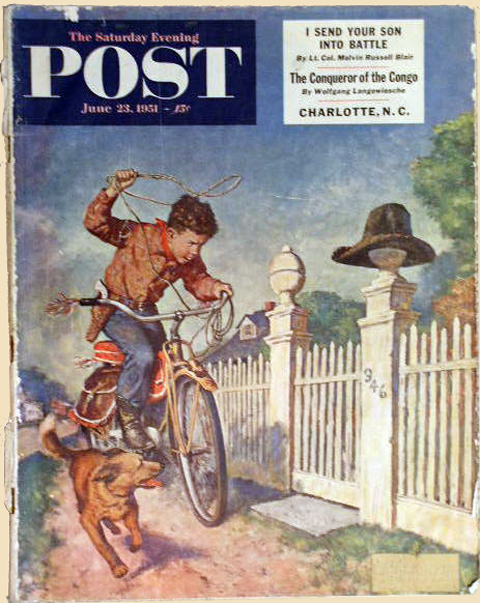 Mulford wrote 28 more books featuring the cowboy. 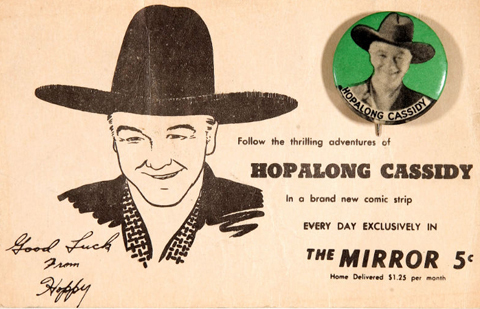 Hopalong was so popular that movies and TV shows were made based on the character. 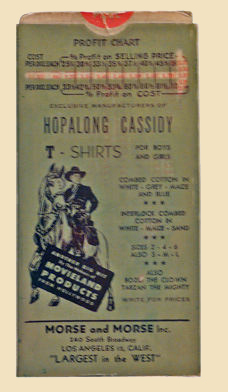 The first Hopalong Cassidy movie, starring William Boyd, was produced in 1935. 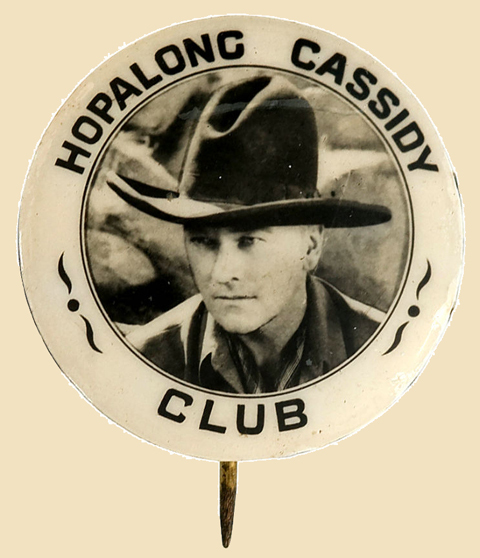 Boyd starred in 66 Hopalong Cassidy movies. In 1948, edited versions of the movies became a TV series, with 52 editions produced. 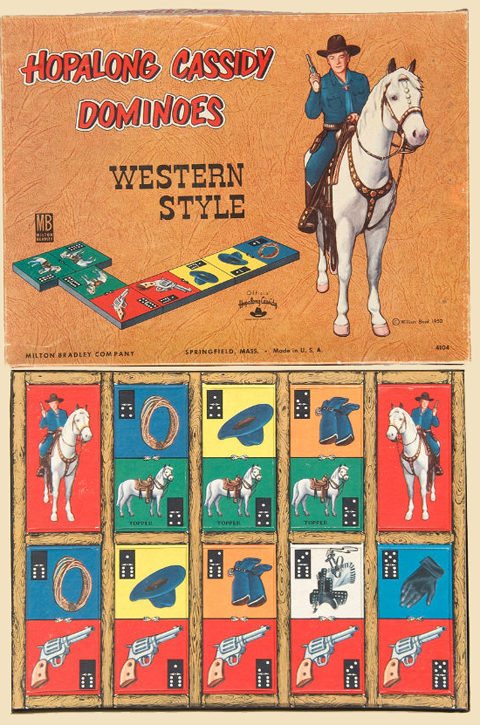 Cowboy heroes were the favourites when I was young. 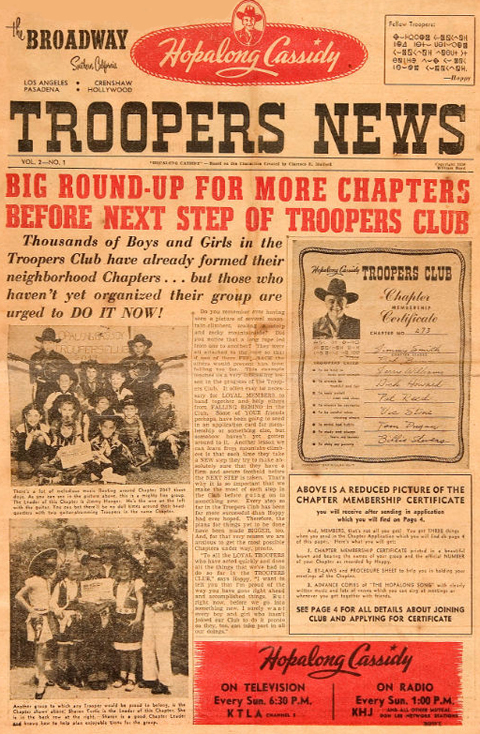 Before we had television, I used to go to the cinema on Sauturday mornings; with all the other kids I cheered The Lone Ranger and Roy Rogers. 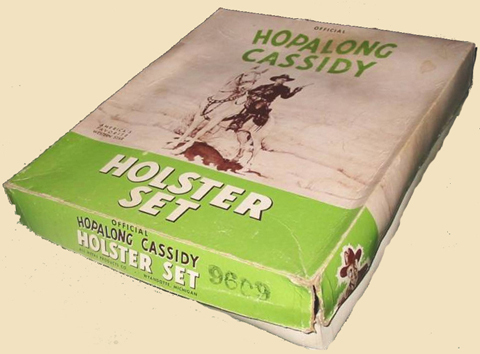 I don’t remember Hopalong Cassidy from saturday morning cinema but we must have had his films because, of course, his name was what you called anyone who’d hurt their leg and had to hobble along. Great Britain in the fifties was more impoverished than the USA. Maybe that difference was reflected in our TV cowboys? 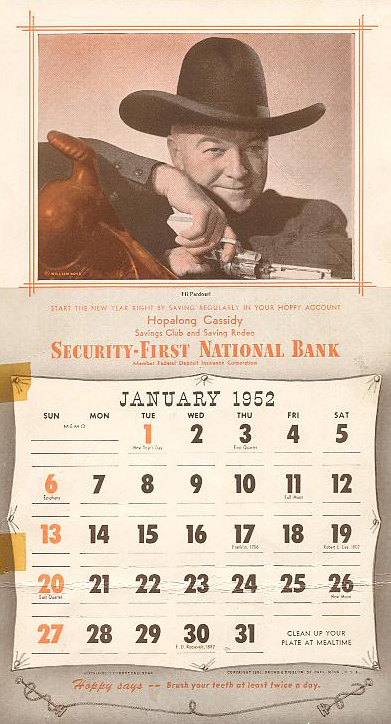 Over there, Hopalong Cassidy got to hunt down and kill baddies. In Great Britain, all the Milky Bar Kid did was eat chocolate. We had older cousins in America, and used to receive some of their clothes when they’d grown out of them. I remember the shirts had button-down collars. The clothes seemed very exotic. My favourite dinky toys were American cars, and collecting dinky toys certainly inspired me to become a vintage vehicle enthusiast many years later. 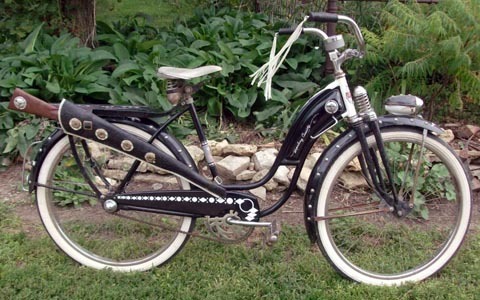 I was born in 1952, just like this bicycle. 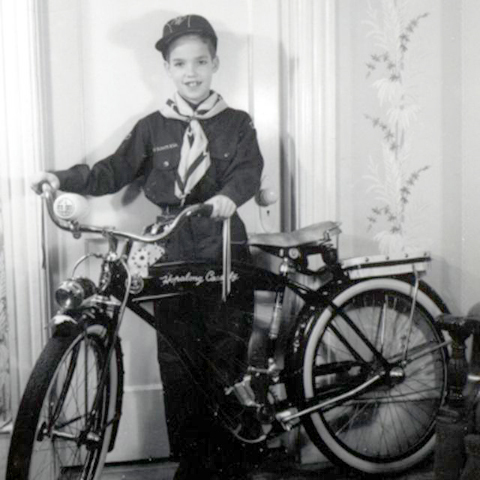 So does owning an American top-of-the-range Hopalong Cassidy Boy’s Cowboy Bike represent not just reliving my childhood, but re-inventing it? 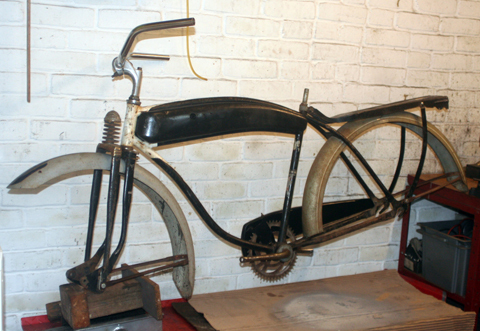 Apart from the fact that a complete restored example would cost many thousands of dollars, I wonder if starting with just the bare frame and forks also has some deeper meaning? 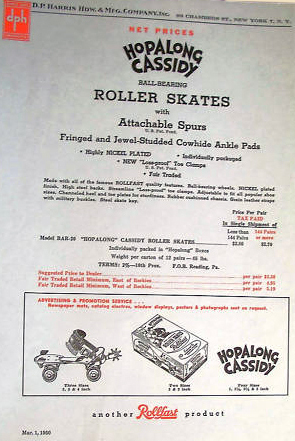 For those whose parents couldn’t stretch to a Hoppy bicycle, there were Rollfast Hopalong Cassidy Roller Skates with attachable spurs. 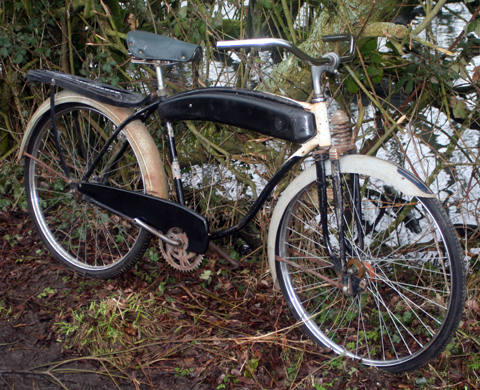 Finally there was a top-of-the-range 26″ version, the Super de Luxe Spring Fork Model. 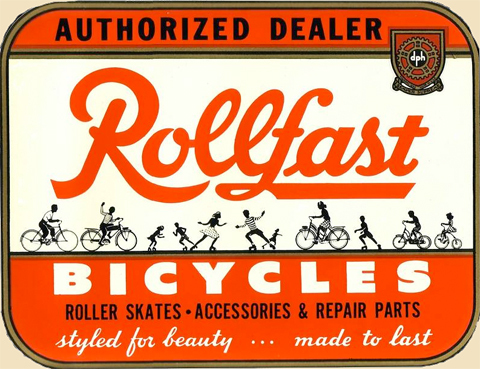 Rollfast’s Hopalong Casssidy Bicycle was a success, selling around 100,000 units in the three or four years it was offered. 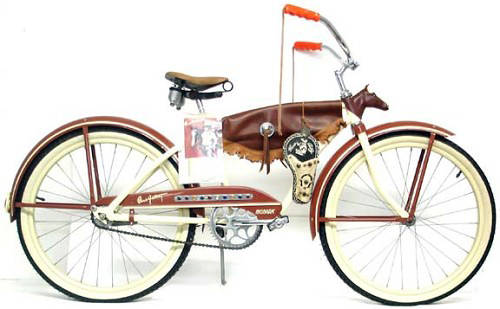 But, despite the company’s promotional letter, the 26″ Super de Luxe was not as successful as the other models. 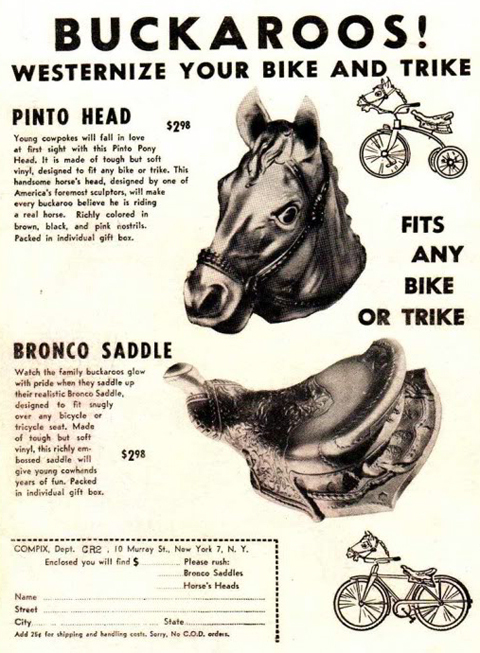 When you consider that in America 26″ bicycles were full adult size, you can see that marketing an adult size bike with a child’s cowboy theme was a risky endeavour. Teenagers in the fifties were more interested in cars and many were driving by sixteen years of age. 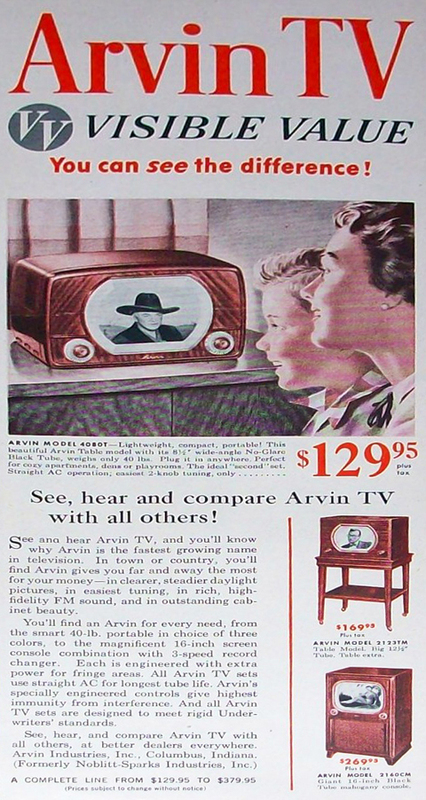 So, sixty years down the road, the 26″ may be the rarest of the models. 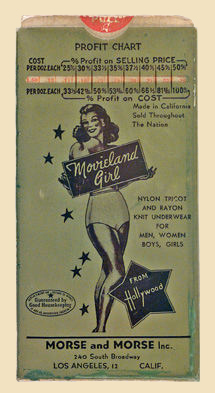 In 1954 a new top model was introduced, the #50. 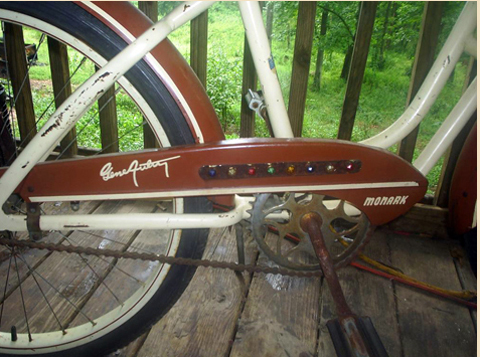 Embossed chrome trim was added to the tank, three tone paint, chrome fenders, deluxe Delta Rocket Ray, new type carrier with tail-light and a new spring fork similar to the Schwinn fork. The “R” design front sprocket was dropped for a five arm sprocket and a new chainguard was added. 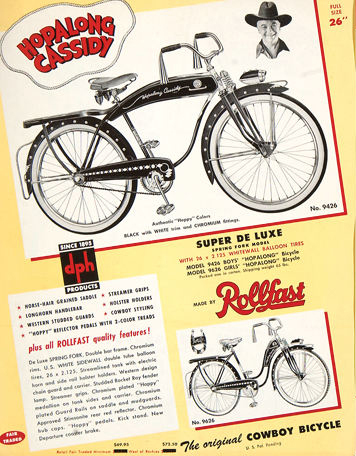 This was the last deluxe balloon tyre model in the Rollfast line. 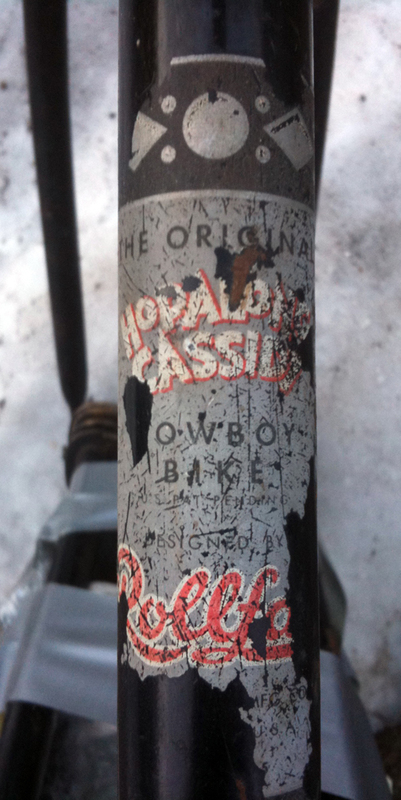 Below you can see a Rollfast Hopalong Cassidy Girl’s Cowboy bike with springer forks, the same as mine. 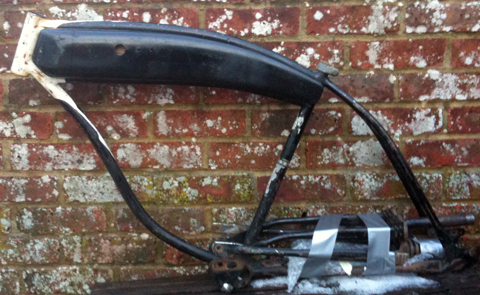 15th December 2009: One thing I really enjoy is looking for the various parts needed for a restoration. In the past five or six years, ebay has made that task very much easier. I used to have to wait until Beaulieu Autojumble rolled along every September to get most of my parts. Ebay is 24/7. And it used to be extremely difficult to buy parts abroad, though in the 1980s my subscription to Hemmings Motor News helped a lot with American stuff. I ventured over to Hershey Swap-meet in 1989. 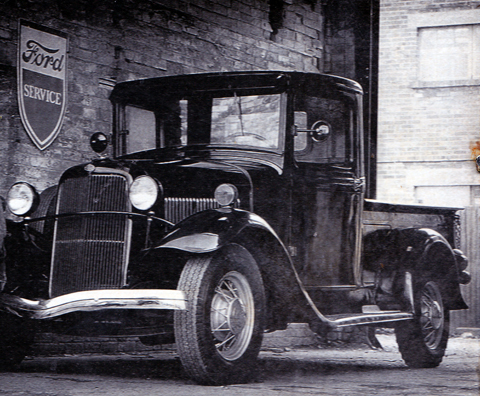 I only bought a few knick-knacks at the swap meet (the world’s largest), because I’d already found a cheap Ford Model B Pickup truck in the local Harrisburg Auto Trader, which I imported to the UK (and, unfortunately, had to sell in 1992 in the last recession). 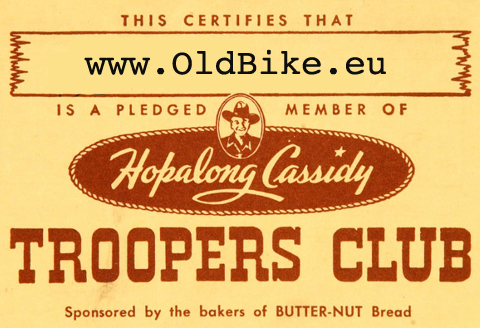 By the turn of the 21st century, with older vehicles mostly in the hands of older people, some of the vintage vehicle hobbies were in danger of dying out for lack of younger owners to take over custodianship. But with increased worldwide spares availability and communication, the internet has given our old hobbies a new life. 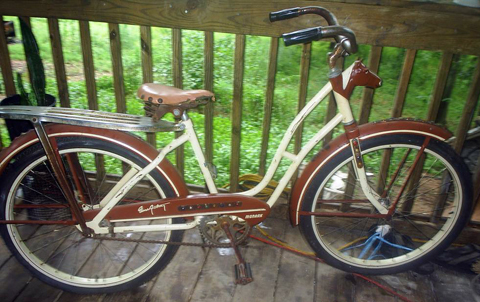 Though I have a few American bicycles, this is my first vintage American bicycle rebuild. I’ll log each step in the process in the hope that readers will be inspired to do something similar. It helps a lot to find a fellow enthusiast who has already restored a similar vehicle. Thanks to my friend Ed in America, the following parts for this project are now on their way across the Atlantic. 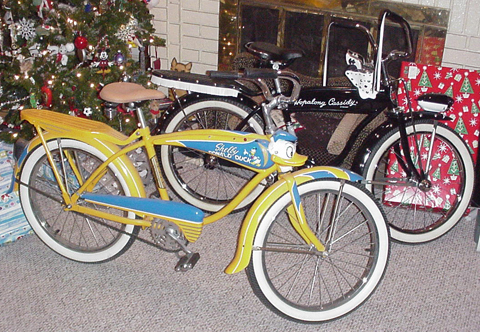 Two of Ed’s restorations, a 20″ Hoppy and a Shelby Donald Duck. 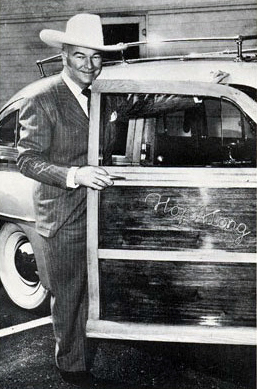 Hoppy was the most merchandised TV or movie character to date. 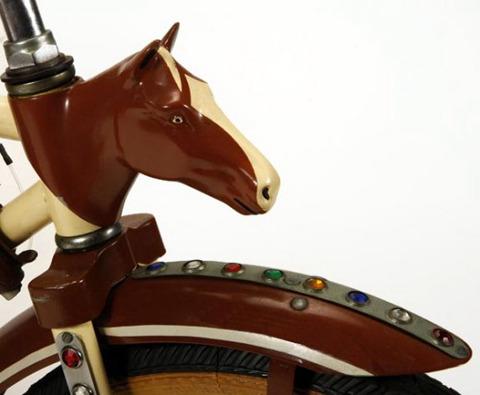 With so many toys, ads and promotional gifts still around over fifty years later, it gives us a wonderful insight into America of the early fifties. 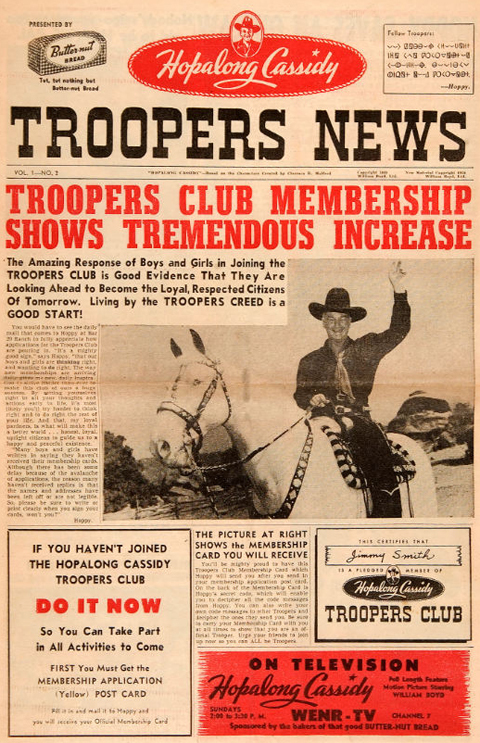 Be an Alert Trooper: Hard-riding cowboys know it takes plenty of food to keep ‘em strong in the saddle – and that goes for you Troopers, too! So eat three square meals a day with plenty of good-tasting, energy-building Butter-nut Bread! Every delicious, soft slice of Butter-nut Bread is ‘one to grow on’ – enjoy Butter-nut with meals and between meals too! 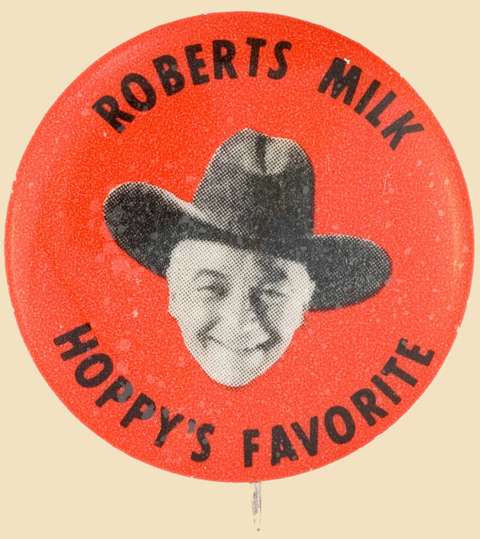 It looks to me like Hopalong Cassidy’s Butter-nut Kid might have been the inspiration for Great Britain’s Milky Bar Kid. 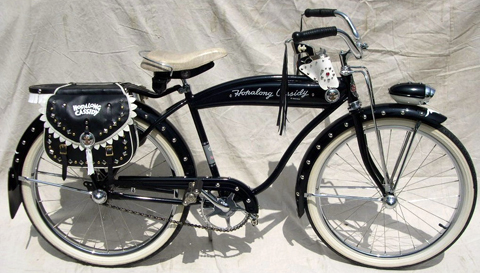 Monark introduced the Gene Autry bicycle in 1950 to try and compete with Rollfast’s range of Hopalong Cassidy bikes. 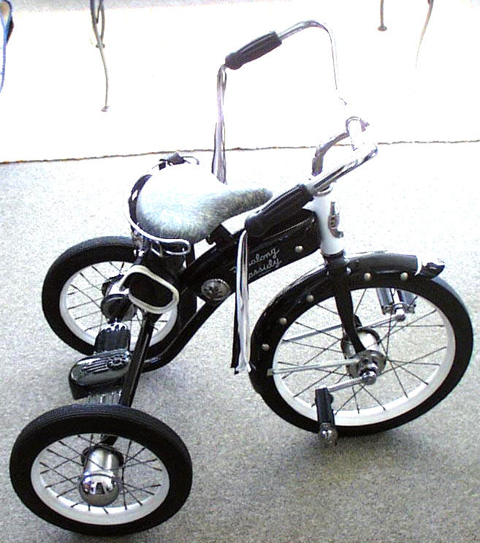 A boy’s and a girl’s model was offered, both with 20 inch wheels. Here are some pictures of them for reference. 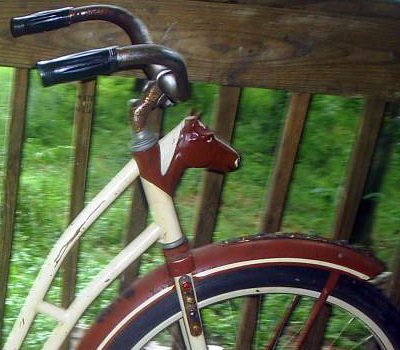 Monark’s idea of a horse head just above the front fender was a nice touch. This well-presented fully dressed boy’s model was in an auction. 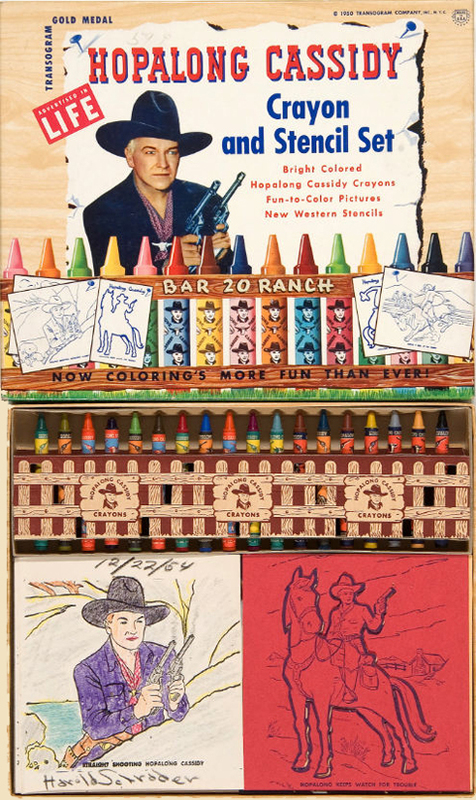 The Gene Autry did not sell well. 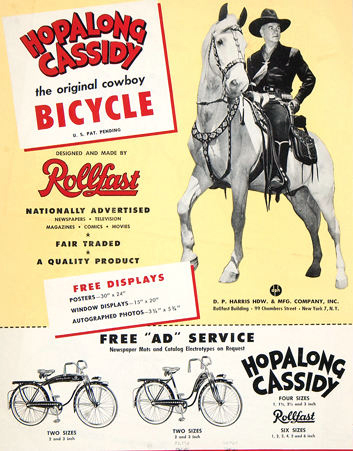 The Hopalong Cassidy was so well marketed I’m sure it would have greatly overshadowed the Monark. This girl’s model was for sale recently. 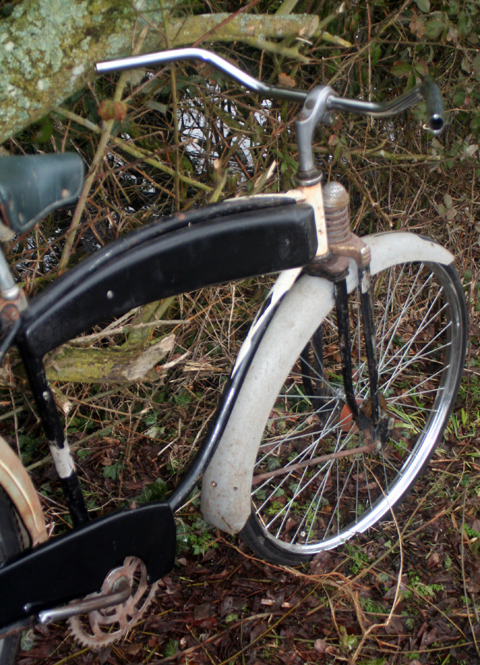 It may look mundane without its accessories, but this is a very rare bicycle these days. 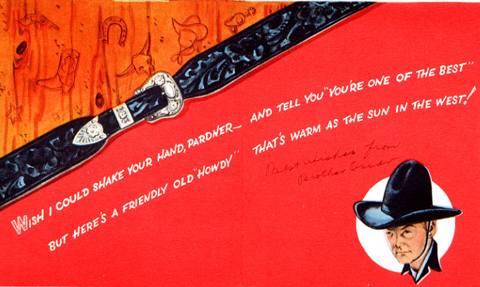 The chain-case featured Gene Autry’s signature. 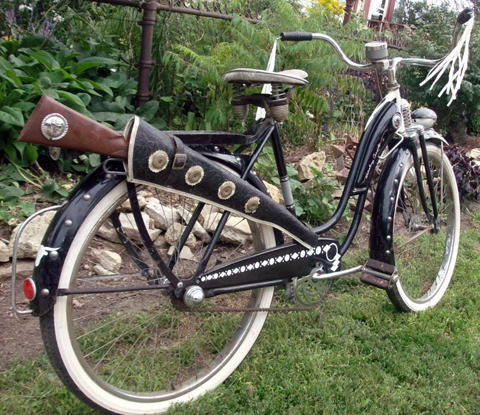 The cap gun and holster could be attached to the tank of the bicycle. 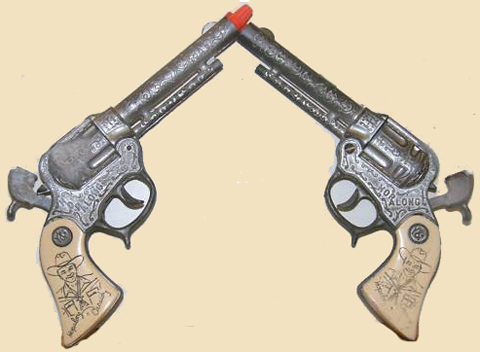 The gun pictured below was not connected with the bike; the Zoomerang Gun fired a paper roll. 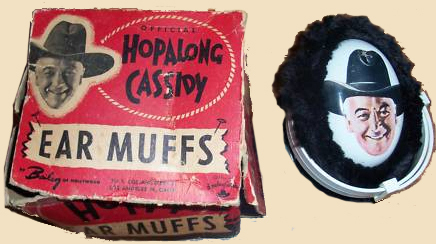 Many Hoppy promotional items were made of cardboard and paper. 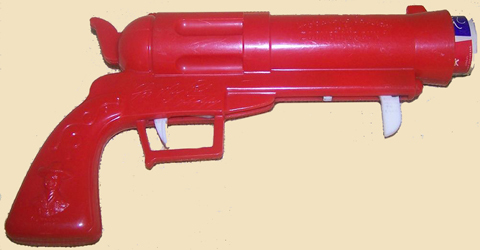 It’s surprising that the Lexington Dairy gun shown below has survived. 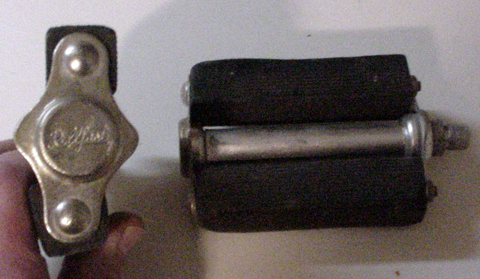 The cardboard gun below is 5 1/2 inches long. 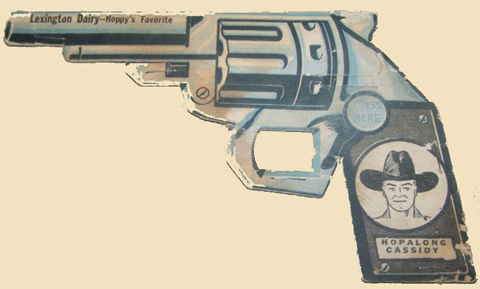 This cardboard Hoppy gun is interesting because it’s a birthday card. 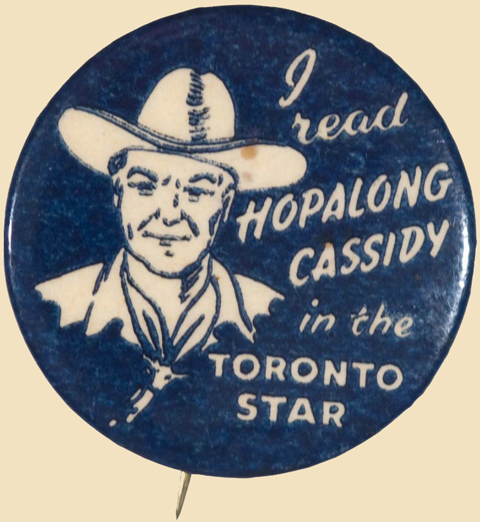 Below, you can see a range of Hopalong Cassidy badges. 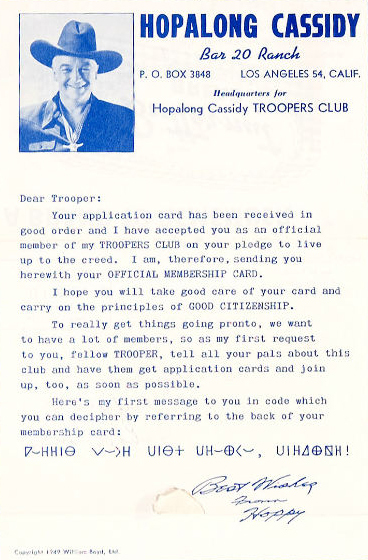 Badges were, of course, cheap to produce, and many companies made them in joint promotions. 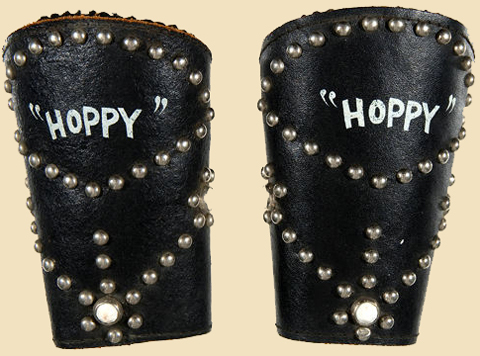 Being metal and so more durable, they are probably the most common Hoppy artefact still around 60 years later. 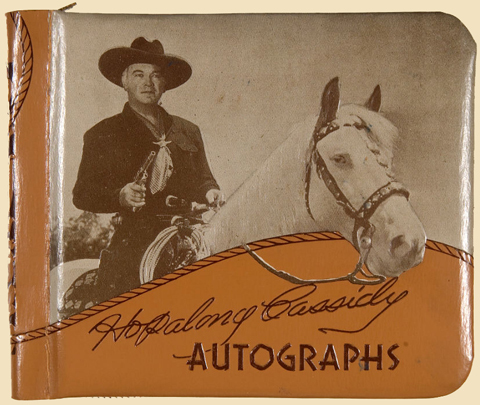 The image of Hopalong Cassidy on his white horse has been around for so long that it is almost an American icon. 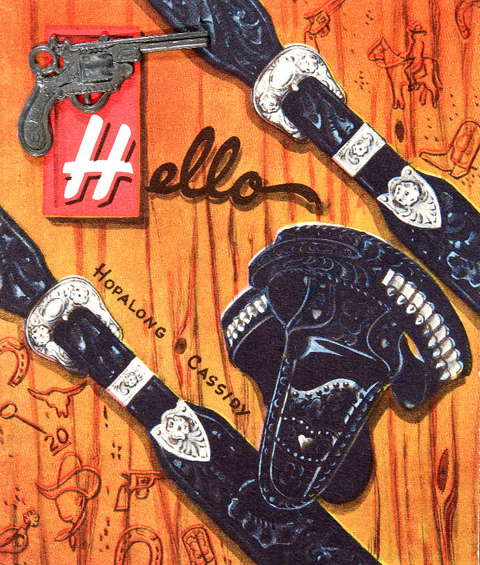 The popularity of Hopalong from the 1930s through the 1950s and even beyond made him a natural to be incorporated into the design of a radio in this period of the medium’s greatest growth. 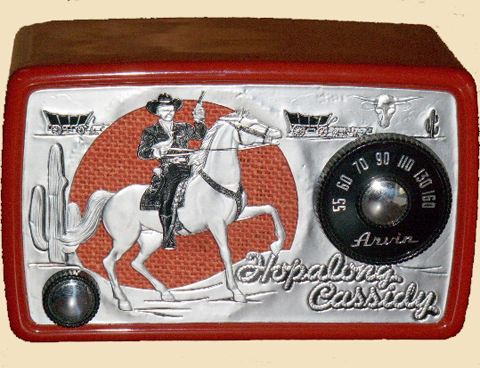 The Arvin Model 441-T or Hopalong Cassidy Radio, originally priced at $16.95, was manufactured in 1950 using two styles of embossed, paper-backed, aluminum foil fronts. 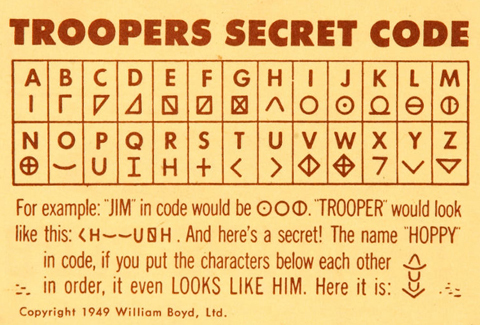 William Boyd bought the rights to his Hopalong Cassidy character in 1948. He released edited versions of the films (totaling more than 100 by the time he retired) to the then young medium of television, first through KTLA in Los Angeles and then nationwide through NBC. 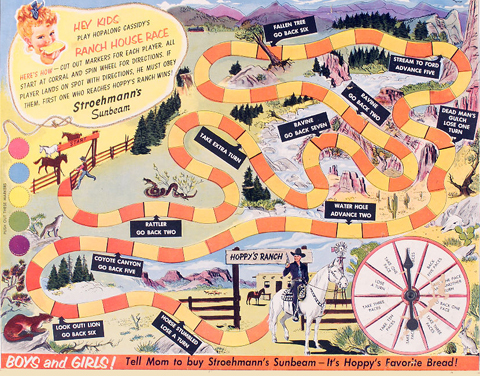 Additional new episodes were shot as well, with Hoppy’s popularity increasing all the while. 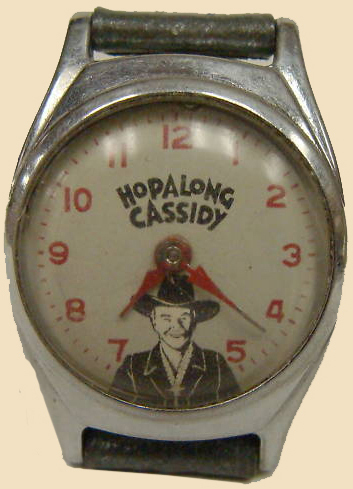 Hopalong Cassidy sagas were also on the radio from 1950 to 1952. 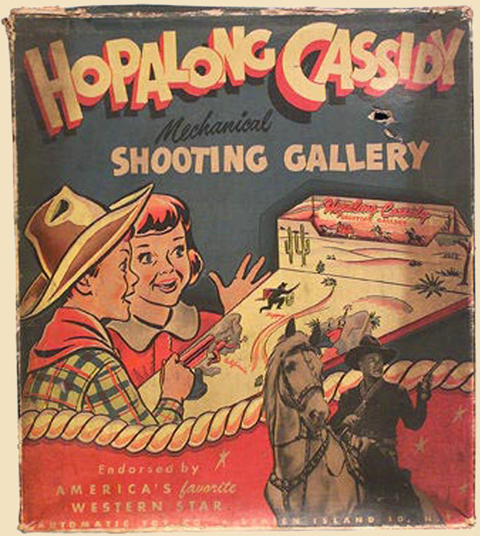 A long-running Hopalong Cassidy comic book series, published by Fawcett, added to this marketing success story. You could easily become totally obsessive and fill your house with this junk. I’ll stick to the bicycle. UPDATE: 14th January 2010. The bike has now been collected by DHL in USA, and is on its way across the Atlantic. I’ll take some photos when it arrives. 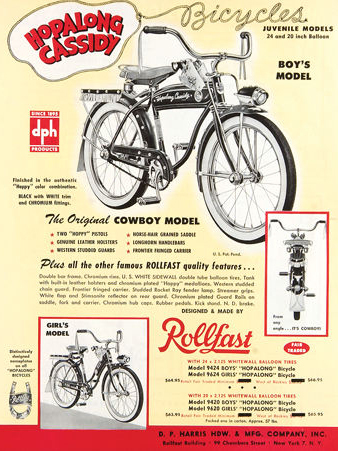 I wonder if any Rollfast Hopalong Cassidy bicycles were imported into Great Britain in the fifties? UPDATE: 16th January 2010. Well, that didn’t take long. The Hoppy box has arrived already. Here are a few photos. I’ll take some more as it’s prepared for assembly. We’ve now done a basic assembly in order to assess it. 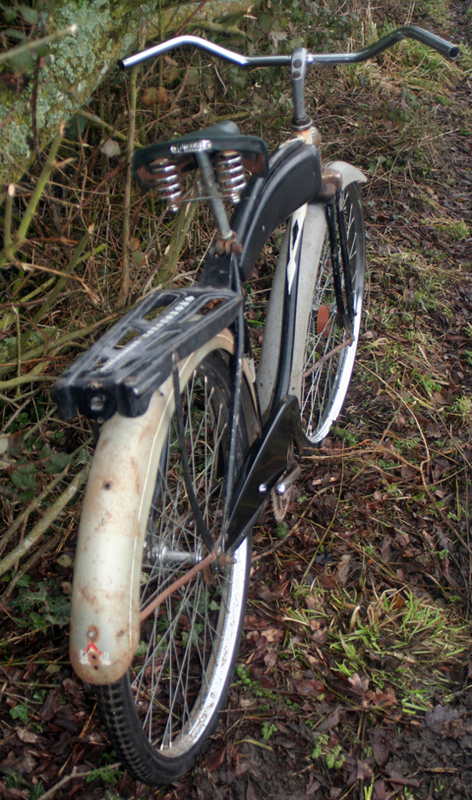 And I’ve balanced a British saddle on it and rested it on some British wheels in order to see how it looks standing up. When I’m doing a restoration from a pile of bits I like to be able to visualize as soon as possible into the job what the finished result might look like. Even more so in this case because there are a number of decisions to make. 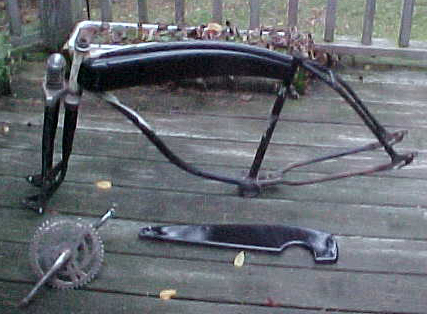 I want to do as little cosmetic work on the bike as possible. 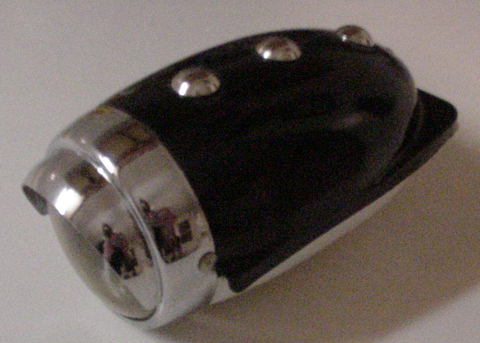 Hoppy fenders should be black, with rivets fitted. 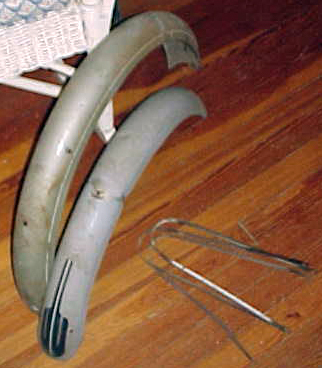 But I wasn’t sure whether to leave these fenders as they are for now. 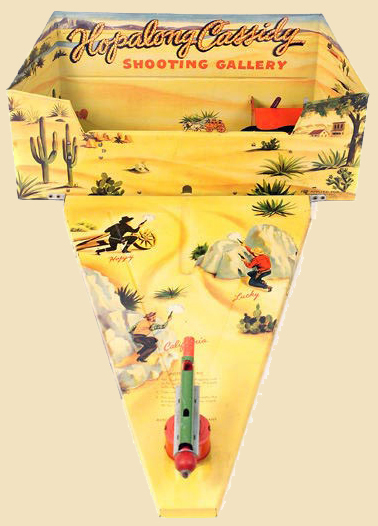 However, the tank needs its Hopalong Cassidy transfers applied. Unfortunately, the tank has been roughly painted over rust, so the transfers will not stay on as it is now. Having to repaint the tank helped me to decide to repaint the fenders too. 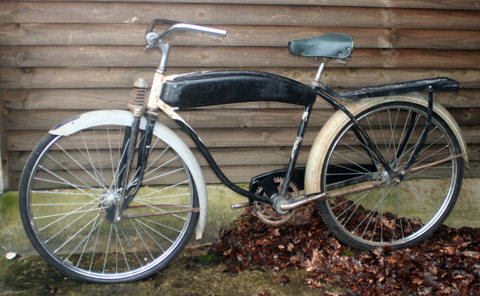 Next job will be to find wheels and a saddle that suit. 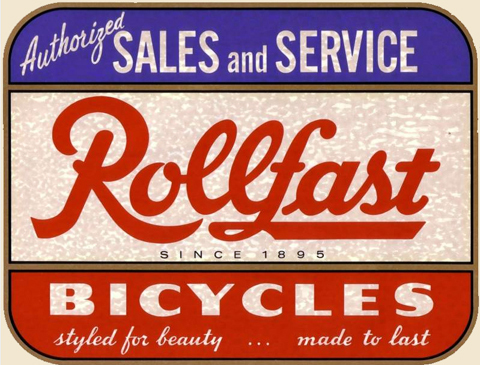 Looks like The Saturday Evening Post of June 1951 was drumming up trade for Rollfast.